It was a chilly spring afternoon in the Iron Age village. Hundreds of men, women and children gathered near wattle and daub roundhouses with conical thatch roofs to eat, drink and listen to music. Most people were dressed as colourfully as the free range roosters. Some wore ivy or floral garlands. Many had painted their faces. One man wore the richly embroidered robes of a Druid high priest and sipped a golden brew made of fermented malts and hops. A mast beast – a spooky creature comprised of horse’s skull on pole with a cloth covering – cavorted while her companion shrilled a flute. As dusk approached, everyone made their way towards a hillock at the edge of the village with woods behind. On this rise towered a wickerman with a deer’s head; an effigy of the god Cernunnos. Despite its name, this figure was not made of wicker but rather of nine different types of wood. All afternoon, worshippers had been tying prayers to this fifty-foot high idol, waiting for the moment when it would be set alight and their prayers lifted to heaven by sparks and smoke. Now the crowd is contained behind a small fence with a gate. The people grow silent as a man with long white hair and matching beard stands quietly in front of the effigy. Dressed in blood red and black garb, he is in charge of the great wickerman. His arms hang stiffly at his side and he breathes in, as if inhaling the spirit of the place. ‘Please!’ cries a latecomer to the ceremony, stretching his hand over the gate towards the priest. ‘I have a prayer to tie to the god.’ In his hand is a small roll tied with yarn. ‘I can run up there very quickly,’ pleads the man. Earlier, the haunting strains of music filled the dusky hillside. Now as darkness gathers, a troupe of long-haired drummers come thumping through the crowd. The gate is opened for them. Banging their drums, they mount the little rise and take their places around the great woven statue. At a signal from the priest, the drums fall silent. The priest turns to the crowd. ‘We are about to set the wicker man alight!’ he announces. ‘Today is the last day of winter. Tomorrow is the first day of summer. You women,’ he adds, ‘don’t forget to get up at dawn to wash your faces in the morning dew. Trembling with excitement and dread, an eight-year-old boy moves forward, urged on by his family. The priest hands the boy a torch and helps him light it in a small campfire. Then they mount the slope to the fifty foot high structure. Earlier, the priest had spread hay around the base of the wicker man. Now the boy touches his flaming torch to these feet of straw. There are no people or animals trapped in this Cernunnos, only the little prayers tied on earlier, before the ‘magic was closed’, but the crowd cheers as the flames take hold of the legs and lick up towards the torso. The long-haired drummers begin beating again. The crowd cheers, the drums throb, the effigy sends forth billowing plumes of smoke mixed with sparks. Now heat from the burning man lights the rapt faces of the watchers and warms the chilly night. It is the last day of April. The venue is Butser Ancient Farm in Hampshire and most of the people in the crowd have driven here in their cars. Some of them are ‘live Tweeting’ the ceremony, using the hashtag #standintheglow. 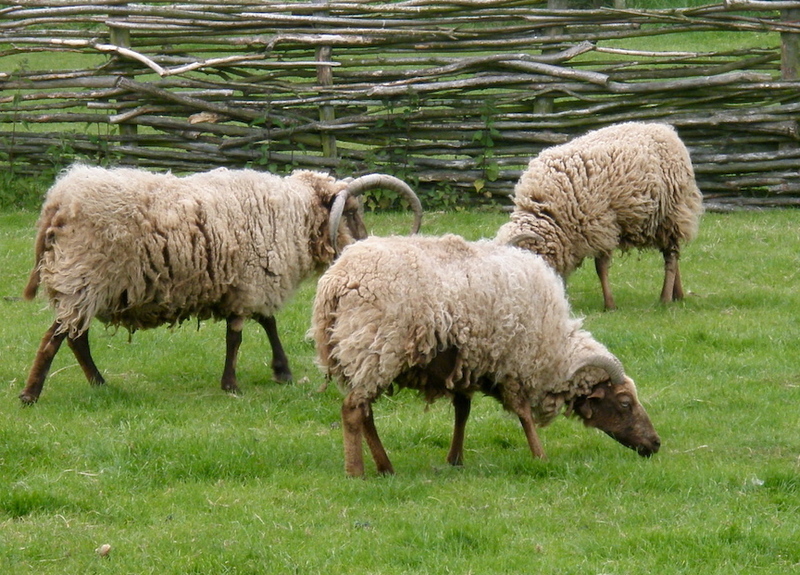 Butser Ancient Farm is a treasure box for historians and writers of historical fiction. It began in 1970 with a decision by the Council for British Archaeology to construct a working ancient farm where archaeologists and historians could test theories on how people lived in Iron Age times. Now on its third site at the charmingly-named Bascomb Copse it comprises five round houses of slightly different styles, animal pens for the heritage sheep, goats, pigs and chickens, a blacksmith’s shed, storage huts, a tiny thatched chicken coop, a visitor’s centre, a replica Roman villa and – my favourite structure – a wattle outhouse. Hands on activities for children include a live dig, ancient writing and bashing chalk. Adult workshops are designed to access not just the Iron Age but also Stone Age, Roman and Saxon eras and include sessions on daubing, clunching, sweeping, thatching, wattling, felt-making, cave-painting, sword-making, flint knapping, ancient apothecary and even coracle-making. Last September, my husband and I went on an Iron Age cookery course. We met one glorious sunny morning in a dim round house. A dozen of us sat on round log stools in a circle on the chalk floor around an open fire. Our tutor, Madeleine Alison, told us that she always begins her sessions by taking a moment to be silent and breathe. So we did. The peace was immense. Even the roundhouse seemed to hold its breath. We could hear birdsong and the breeze and the occasional baa of a sheep, strangely comforting. We washed our hands by rubbing them on soapwort and rinsing them in a wooden bucket of water. Later we shelled hazelnuts, made mackerel pâté oatcakes, baked caraway and poppyseed flatbread and simmered up a lambshank stew. While waiting for the fiery main event, visitors can listen to live music, eat food and visit various stalls and activities. You can weave a garland, have a go at blowing a trumpet made of horn and listen to Jonathon Huet tell a story by the crackling wood fire in one of the roundhouses. Liz Barnes-Downing taught me how to make a Crosh Cuirn, a charm from the isle of Manx made by tying two twigs of rowan with a piece of fresh yarn. I twisted the yarn myself, taking the greasy wool and using a drop spindle in a clockwise motion. You are meant to hang it over your door to keep out the bad fairies. A lady selling faience told me which minerals add colour her faience beads, an early form of glass famous in Egypt but also known in Iron Age Britain. ‘Guy the Bushcraft Guy’ presided over a display of Iron Age food and let me sniff pungent Birch Oil, which will keep away ticks. I could smell the distinctive creosote smell of it as we gathered to watch the burning man, the highlight of the evening. After the burning man had become a smouldering framework, you could go up to the Roman villa, where the Hampshire Astronomical Group had set out telescopes, and gaze at the stars. However, most people were ready to go home. Everyone was given a flaming torch and I watched a line of lights move up the curve of a black hill, gold against the peacock blue sky of almost-night. The taxi that would take us to Petersfield station was waiting by the side of the road and we gratefully stepped into its warmth and light to return to the 21st century. 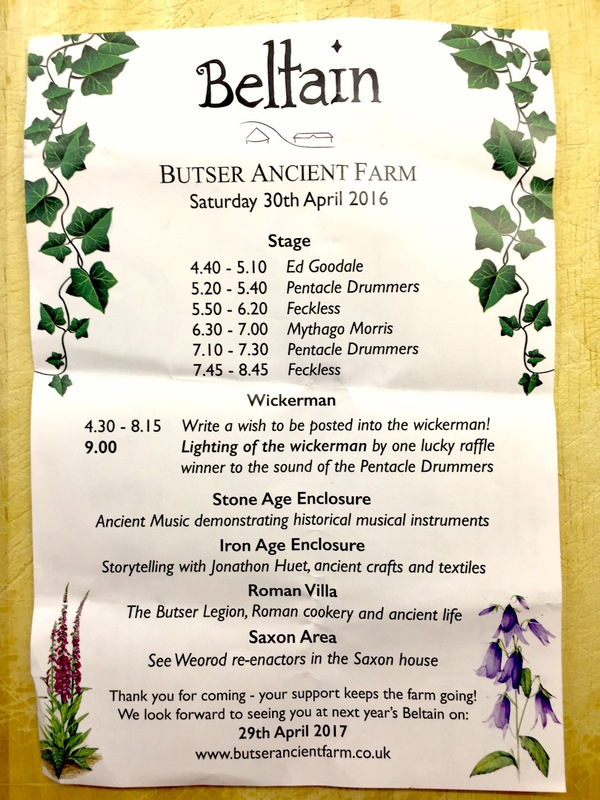 But we will return to Butser Ancient Farm! Caroline Lawrence is writing a series of books set in Roman Britain. 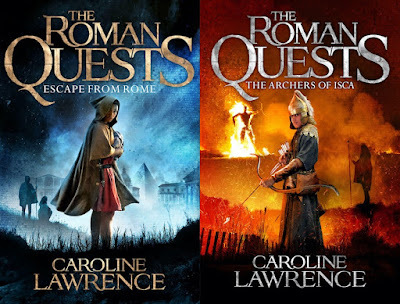 The Roman Quests: Escape from Rome and The Archers of Isca are both out now. Now that sounds just marvellous! 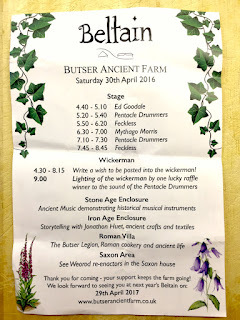 I had never heard of Butser, so another thank you - and for your account of the ceremony and the place. This sounds a great place for a visit! Fascinating! I've never heard of Butser, I shall have to look into visiting.